Last edited by EQUIPD; 01-08-05 at 23:18.
you would be extremely stupid to blow it off with compressed air. just get a container of either thinners or water , both neutralise paint stripper pretty well. Well I've been asking around all of last week, Panel Beaters, Paint joints, asking them whether I should spray it with 2pac or whatever, and they've old told me that no paint will last- long term and hold its colour. They seemed to think 2pac would be a waste of time, so it looks like I'm just going wrinkle red. I also saw that you can get it in yellow and blue, but those colours loose their heat abilities. i'm just going to use a standard acrylic water based paint straight from my airbrush on mine, i might paint it blue with a pearl in it, maybe blend it ti onother colour! then i'l just seal it with a couple of coats of clear. the rocker cover doesn't get extremely hot maybe only on the exhaust side. should be ok though. It's not a VL rocker cover, but I painted the cover of my Ecotec. Come up pretty nice. most peoples rocker covers will , but mine , nah. my clear - and the amount of non-yellowing pigments in it , it should stay clear for a while. Isnt there a rocker cover gasket? and shouldnt you use a new one when re-fitting the rocker cover? If not.. Im painting tomorrow..
Tempus: Thats not your rocker cover... thats a plastic cover for your inlet manifold. your rocker covers are the grey things below and to either side of what you have painted... Close, but no cigar! Last edited by ExecTurbo; 10-03-05 at 02:14. Yeah theres a seal. But from what I've read you don't have to replace it unless its busted up. And just make sure its in the right spot when you put it back on. And your sweeet. I'll be painting mine..... Not sure, saturday maybe. Tell me the throttle body doesn't have to come off though, inlet piping and a few screws and thats enough? Please..
Oops, I'm not painting it saturday- might strip it, may get to the painting depending on the time. Yeah basically inlet piping...and your throttle cable and anything else in the way...Just becareful getting it in and out and try not to hit it or scratch it.. 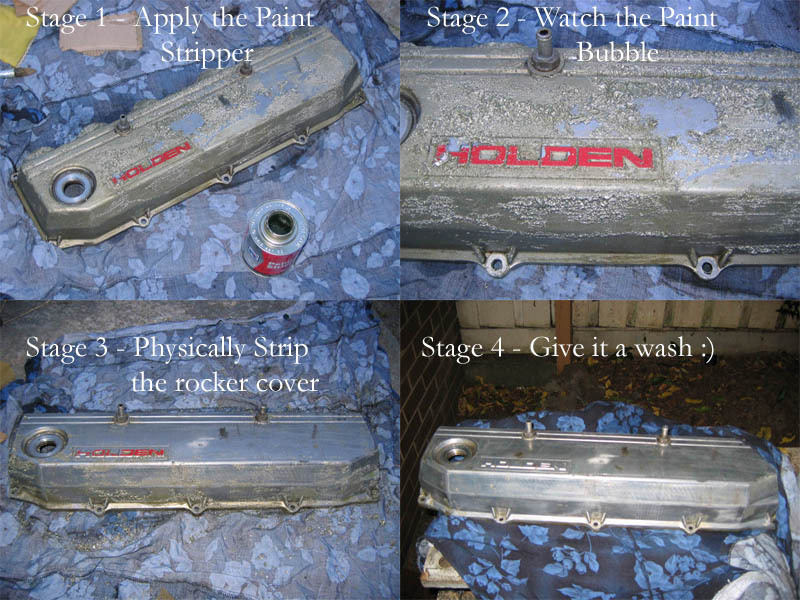 I painted my last rocker cover in 2 pac and it lasted 1.5 years and is still good for the person i sold it to.Ive had the one painted on my VLT for about 6 months so far and it still looks like its just been painted today and its also done in 2 pac.so its seems to work fine 4 me.ive also have my last block and head painted in the same and there still good too(just make sure you take your time with prep work and it will be fine). id love to do it and it seems real easy but im still not sure about taking the cover off. what about the gasket underneath the rocker cover? im just double checking so that i can do it easily. while its drying overnight did you chuck something ovver the engine to stop **** from getting in?? sorry if i sound like i have no idea, its coz i really have no idea!! It comes off easy it's just screws holding the rocker cover in and the gasket that sits between the rocker cover and the head actually sits in a groove underneath the rocker cover so you can't stuff that up. Apart from that all you need to do is unscrew the inlet piping and manouvre it out. It's not hard at all. And I just closed the bonnet as soon as I took it off because I didn't have anything CLEAN to put over the engine, and it would have done more worse that way than good. I guess you could put a clean tarp over it if you are worried but with the bonnet closed if the area is fairly clean you shouldn't have any trouble. can ya post up a pic of it in da bay? ok, cheers antho. im doin it, i know i only have an n/a but hey i dont care, it will make the bay look nice lol. While i was at it, i resprayed my terrible intercooler piping, it used to be all black and scratched, its now metallic silver, still looks shotty, but better then it did before. Looks good, just polish that plenum. i agree.. polish the plenum and that bay will look mickey mouse! What is the best method to polish up the plenum?